The UK Labour Party’s ruling body has agreed to adopt in full an international definition of anti-Semitism, after months of rows. The International Holocaust Remembrance Alliance’s definition was incorporated into Labour’s code of conduct in July – but not all its examples were included. The party will now incorporate all 11 examples, its National Executive Committee (NEC) has decided. But it will also publish a statement aimed at protecting free speech. A Labour statement said: “The NEC has today adopted all of the IHRA (the International Holocaust Remembrance Alliance) examples of anti-Semitism, in addition to the IHRA definition which Labour adopted in 2016, alongside a statement which ensures this will not in any way undermine freedom of expression on Israel or the rights of Palestinians. Shadow business secretary Rebecca Long-Bailey said the NEC decision was a “clear indication of our direction of travel” and Labour would now hold a consultation on changing the wording of its code of conduct. Perhaps this marks the beginning of the end of this sorry mess. But what makes an early resolution tricky is the caveat that Labour has included alongside. It will be important to many of Mr Corbyn’s supporters who want the right to criticise Israel. But for those campaigning against anti-Semitism, it still sends a message that Labour might want to make exceptions, that the party is saying “yes, but”, rather than “yes, of course”, to loud demands from the Jewish community that they take the strongest action possible against those who would foment tension. She said the party needed “a comprehensive and legally robust document with which to implement action against our members who might breach the IHRA examples and definition”. 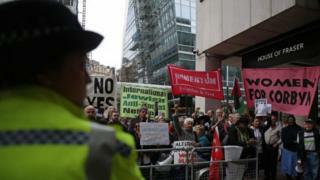 Rival protesters gathered outside Labour’s headquarters as its senior officials discussed the issue. Some activists wrapped in Israeli flags condemned Labour as being “for the many, not the Jew” while others urged the NEC to resist calls to adopt the IHRA definition, one carrying a banner stating “criticism of Israel is not anti-Semitism”. Mr Corbyn had set out some of the concerns Labour members had raised about limitations on freedom of speech in his statement at the NEC meeting, as well as urging the party to adopt the IHRA definition in full with all examples. Jewish groups welcomed the “long overdue” decision but said it must be backed up by “firm action” against anti-Semites in the party. The Board of Deputies of British Jews said the Labour leader should also apologise for “past anti-Semitic comments and affiliations”. 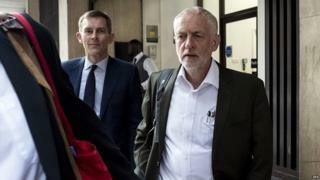 Campaign group Labour Against anti-Semitism said it was disappointed by “the attachment of a “clarification” that risks giving racists in the party a get-out-of-jail card”. Labour has been mired in a row over anti-Semitism for months, with some Jewish groups and Labour MPs claiming leader Jeremy Corbyn was not doing enough to stamp it out in the party. But supporters of Mr Corbyn argued that adopting the IHRA definition with all examples would restrict freedom to criticise Israel’s actions against Palestinians. Labour MP Chris Williamson, an ally of Mr Corbyn, said Jewish opinion was not “homogenous” when it came to backing the definition and the party’s decision to adopt it was a “pragmatic” one. He told BBC News that the row had not damaged Mr Corbyn in any way and urged the “small element obsessed with the issue” to now get behind the party leader. 25+ Worst Classic Album Art According To Vintage Everyday That Will Leave You Asking Why?